Are you ready for a little good news on climate change for a change? Just a smidgen, but good news nonetheless. With help from Midwest Solar Power LLC, Madison Audubon is getting into the business of producing carbon-free, solar electricity. We’re installing a 7.6-kilowatt photovoltaic array at our land steward’s residence on Prairie Lane at Faville Grove Sanctuary. In full sun, the array will produce 7,600 watts of electricity that will run backwards through the electric meter into the local utility’s wires, producing about 10,000 kilowatt-hours of clean energy per year. No, this won’t save the planet, but it is a step in the right direction. Plus, it says something about the economics of solar electricity when our finance committee concludes that, aside from its environmental benefits, the project represents a smart investment of donated funds that will return substantial cost savings over its estimated 30-year lifespan. Prices of solar electric panels have dropped steadily in recent years. If you’re a homeowner with a sunny spot that isn’t already occupied by your vegetable garden, you can claim a federal tax credit of 30% of the cost of a system installed through 2019 and receive a rebate of up to $2,000 from the Focus on Energy program. As a non-profit, Madison Audubon can’t claim a tax credit, but we did secure a Renewable Energy Grant from WPPI Energy, a Solar for Good grant from RENEW Wisconsin, and a Focus on Energy rebate, totaling about half the project cost. One of the 25 panels was donated by Midwest Solar Power, and the remaining panels were paid for by generous donations from MAS members like you! 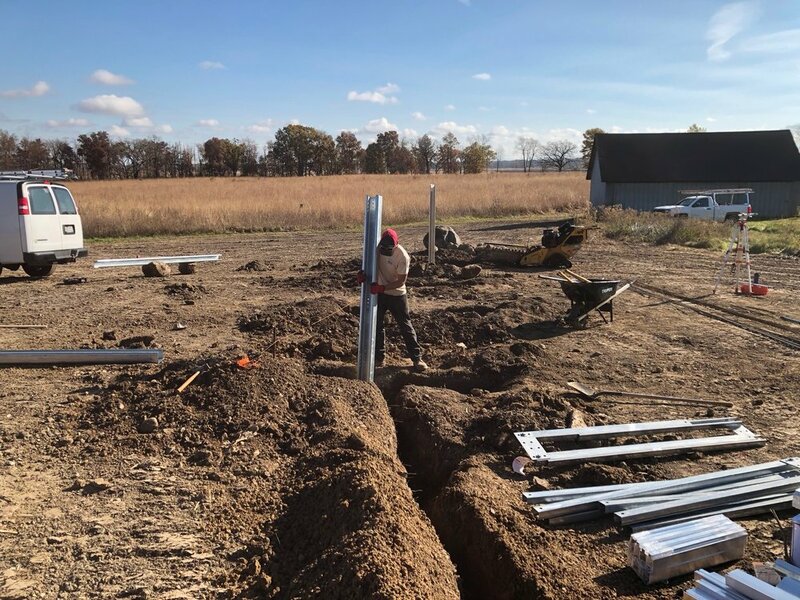 We hope to install photovoltaic arrays at Goose Pond Sanctuary next year, so for those of you who lack the needed sunny spot (and those of you who just can’t get enough of the sun), you can still get a solar buzz with a contribution to Madison Audubon. Spring is prescribed burn season here at Faville Grove, and across southern Wisconsin. There's a lot that goes into a prescribed burn: We take into account the relative humidity, soil moisture, wind speed and direction, temperature, and sky cover. We also need to notify neighbors, the county sheriff, and round up a crew of volunteers on days of a burn. Setting fire to the landscape can be a thrilling experience, but the best burns are those that are boring--excitement means something unplanned has occurred and unplanned events with fire are not a good thing! 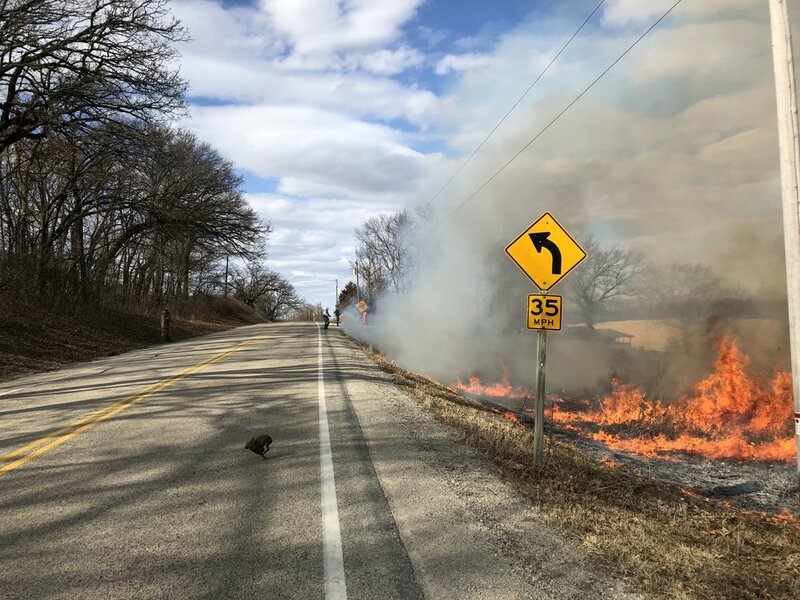 You can see in these photos that we only burn when conditions are ideal for what we're trying to accomplish; in both photos with the road, you'll see that the wind is sending the smoke billowing away from the driving lanes, which is necessary for us to conduct a burn along these areas. Spring is typically the best time for us to accomplish our goals in a prescribed burn. The vegetation is not actively growing, and the strong underground roots systems of prairie plants have evolved with fire and are not at all damaged by these burns, in fact, these burns stimulate nutrient cycling, flowering, and seed production--making it a booming area for pollinators, birds, and seed collectors who are gathering seed for future prairie restorations. We will occasionally burn in late fall in areas like Martin and Tillotson Prairies--wet prairies that are often too wet to burn in the spring. However, these burns somewhat limit habitat for overwintering birds and mammals, so we try to limit the area burned. We'll also burn in summer during the growing season, usually in small areas to control problematic weeds like sweet clover or to kill woody vegetation that has invaded prairies. These summer burns would have occurred historically through lightning strikes or indigenous fires. Summer burns are small units, usually less than one acre, but they allow us to knock back a large area of weeds that would take forever to pull by hand. Units are kept small to avoid harming nesting birds, insects, and mammals. Our burn rotations can vary, but typically a unit will not go more than three years without being burned. As these prairie restorations progress and become more mature, it's possible that they won't need to be burned as frequently. There's also a topographic difference in the need for burning. Lowland areas like Martin and Tillotson Prairies need to be frequently burned every year or two or willows and aspen will invade. Dry upland knolls can go longer without being burned as woody vegetation is less likely to become invasive there. Upland woodlands and savannas have a rather longer return interval on fire, but as we are re-introducing fire to these systems, it's best to burn every other year to suppress unwanted woody invasion. The big bur oak overlooking the kettle pond, The General, has not seen fire for decades and possibly over a century. Since European settlement the area was grazed and fire was suppressed. Once grazing stopped, invasive brush like buckthorn and honeysuckle moved in and eliminated the grasses and forbs which would have helped carry a fire, along with the oak leaf litter. Now that we've restored this area by cutting the invasive brush we have returned the fire regime as well. 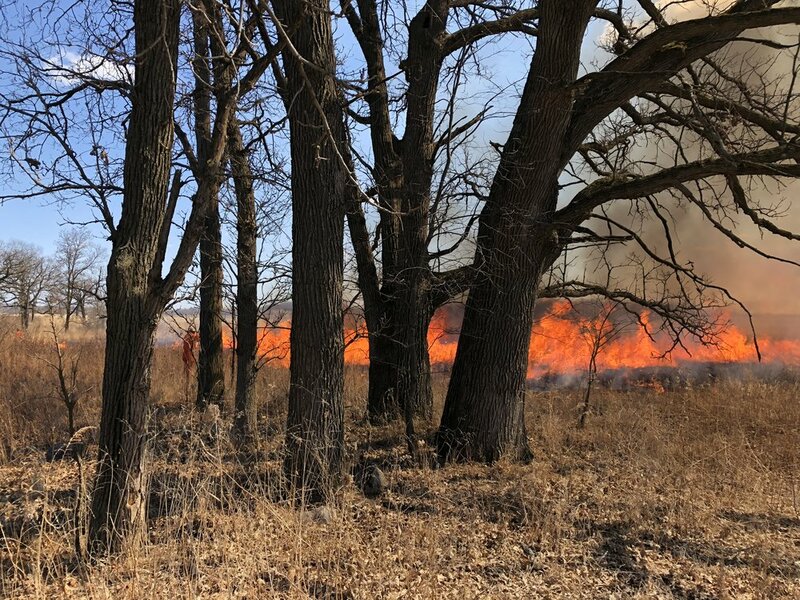 You can see in the picture that the flames, backed by the wind, are only a foot or two off of the ground--these savanna burns tend to creep along fueled mainly by oak leaves, compared to the dramatic 15 foot tall flames of a prairie headfire. Obviously, the variables of fire are numerous, and it takes a lot of work to plan and implement a prescribed burn. However, done correctly, these burns are safe and an important cultural aspect of prairie restoration. A volunteer a week ago commented that the fire on the landscape felt right, even instinctual, and I think there's something to that. My favorite moments of a burn are when we've accomplished the back burn and have blackened a solid portion of the prairie. Then, we can more or less relax as we watch the head fire, pushed by the wind, as it voraciously consumes the prairie and crashes safely into the area that we've already burned.